The Visit Thames website has been created by the Visit Thames Marketing Partnership. The Alliance is a partnership of public and private sector organisations set up to promote the Thames to visitors. We created this site because we want people to make the most of the River Thames. 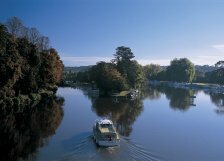 You might be a keen boater or walker already, or you might never have been near the River Thames - whatever your background or interest, we would love you to visit the area! Visit Thames is a great marketing tool, so if you own a business by the river, why not promote it by joining the Visit Thames Marketing Partnership?